“Some part of the male population of Yamnaya culture, had SNP markers, which are currently found only in representatives of the Bashkirian clan Buryjan”. The overall snp (KMS75) was revealed by Sergei Malyshev on the basis of data from the full genome sequencing of the Yamnaya culture. 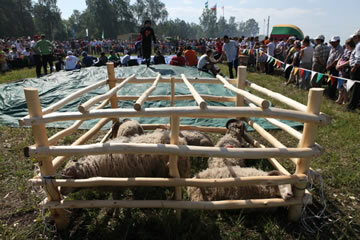 Snp KMS75, currently found only in the Bashkirs of the clans Buryjan and Singran . So, proceeding from the above-mentioned fact, according to paleo-DNA data, the ancestors of Buryjan R1b-KMS75 and Singran R1b-KMS75 were representatives of a Yamnaya archaeological culture. Then, in the Iron Age, the ethnic history of these clans goes back to the Massagetaes-Burydzhans tribes. Massagetaes-Burydzhans lived at the end of the 1st millennium BC. Later, Massagetaes-Burydzhans were included as a separate clan in the Sarmatian tribal union. In detail, the ethnic history of the ancestors of Buryjan and related with their clans — was considered in previous studies, therefore in this article on the ethnogenesis of R1b-KMS75 we will not dwell in detail. Let's note just that according to the KR formula, the common ancestor of all Bashkirs from R1b-KMS75 lived near VIII century AD. 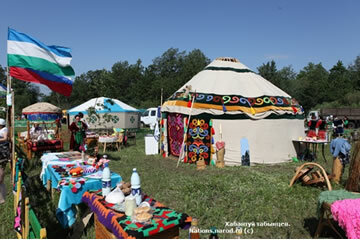 It is noteworthy that even until recently, representatives of the Bashkir clans preferred not to mingle with other clans, which allowed them to preserve the original phenotype of a tribe up to modern days. As a result, the modern phenotypes of some Bashkirian Buryjans and Singrans practically identically repeat the phenotypes of ancient representatives of Yamnaya culture, that is, many anthropological features characteristic of their distant ancestors-Yamnaya population have been preserved in many Buryjans and Singrans. Below are the phenotypes of R1b-KMS75, both ancient (Yamnaya) and modern (Bashkirs). 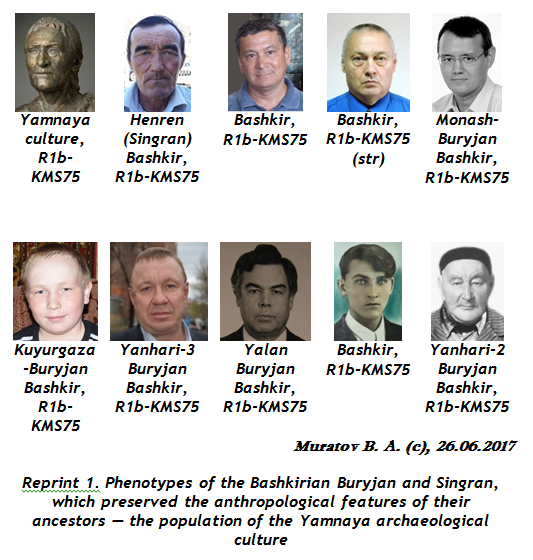 Phenotypes of Bashkirs R1b-KMS75 strongly resemble phenotypes of men from Yamnaya culture. As you can see, in addition to the genetic evidence of the Bashkirs and their ancestors belonging to the KMS75 subclade, we also have anthropological evidence of the origin of the Bashkirian Buryjan and Singran from the population of the Yamnaya archaeological culture. Practically with 100% certainty it can be asserted that the found Yamnaya man from the R1b-KMS75 subclade, with its characteristic phenotype — is the direct ancestor of the Bashkirs from the Buryjan and Singran clans. 1. История башкирских родов. Кудей, Мурзалар, Каратавлы. Том 23. Уфа: ИИЯЛ УНЦ РАН; Китап, 2017. 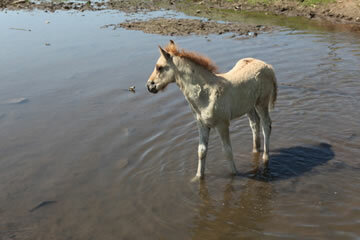 — 808 с.: илл., ISBN 978-5-295, С. 242. 4. KR formula — is the genealogical formula for calculating the lifetime of the common ancestor from the A. A. Klyosov and I. L. Rozhanskii. 67 markers, 3 haplotypes, 850±260 TMRCA. 5. Existing R1b-KMS75 now for today, in the Soraman base by June 26, 2017. 7. KMS75 (str) — it is mean, that KMS75 SNP was not did, but it identified is only by the STR-predictor of the Y-markers. The books of EH Project "Suyun"
№ 8, October 2017 (4), P. 770-788. © 1999-2019 SUYUN All rights reserved.